The best pillow for backpacking is a stuff sack, clothes, and a soft fleece. Here’s how I make them work for perfect, soft, head-supporting, sleep-all-night comfort. First, you could waste money and pack space (plus carry some extra weight) by buying an actual “backpacking pillow.” A range of such products are available, including the Therm-a-Rest Compressible Pillow (7 to 12 ounces, depending on size; $20 – $30); Therm-a-Rest Down Pillow (3 to 7.5 ounces; $30 to $50); the REI Base Camp Pillow (12 ounces, $11.50); or inflatable models like the Exped Air Pillows (3 ounces, $30 to $45). In my opinion, not only are such products completely unnecessary, they also provide radically insufficient head support and cushioning—especially if you’ve got a long giraffe neck like myself. The few times I’ve tried them, I woke up with a kinked neck; there was insufficient padding to keep my head elevated to the point I prefer (high enough to keep my neck straight). Next—and this is crucial—I wrap the stuff sack with whatever fleece I’m carrying to provide a soft layer next to my face and ears. If the stuff sack is sufficiently bulky, I will usually just zip up my fleece jacket, slide the stuff sack inside, and then position it so that the jacket zipper is against the ground. Without this fleece layer, I have to lie directly against the nylon fabric of the stuff sack. Not only is this unpleasant to the touch, it also creates a horribly unpleasant suction against my ears. I prefer using this stuff sack system—rather than simply creating a pile of clothes or fleece—because it keeps everything neatly contained throughout the entire night, even if you roll, toss, turn, or even thrash your way through the midnight hours. You can simplify this process by investing in a “pillow stuff sack,” which is basically a regular nylon stuff sack with a soft layer of fleece on the inside. You just turn it inside out, stuff it with clothes, and you have a pre-installed layer of softness ready to go for only an ounce or two of extra weight. 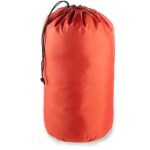 Both REI and Therm-a-Rest offer pillow stuff sacks ($10 to $22).